I am trying to catch up on my Blog visiting since my pneumonia is almost gone (thank heavens)! Gorgeous flowers. Sorry about the bike ride. Thanks for sharing your garden with us. Hi Lori, Your pictures of your flowers are sooo pretty. I weeded a lot too this year and now I have a very itchy case of poisen ivy! Who knew such a pretty garden could be invaded by such a horrible plant:)I searched my garden to see if I could find out where it was but I must have pulled it all out:) I guess I will have to learn how to use gloves. i barely know the names of anything that flowers but i can tell you that our tiger lilies are beginning to bloom and big clusters of spiderwort (who named that?) are, too. the rest are nameless but i am trying to keep them from wilting! Lori, happy to 'see' you again. Your flowers are so pretty! I don't know! My husband, despite my nagging, has yet to update me on the state of the garden. 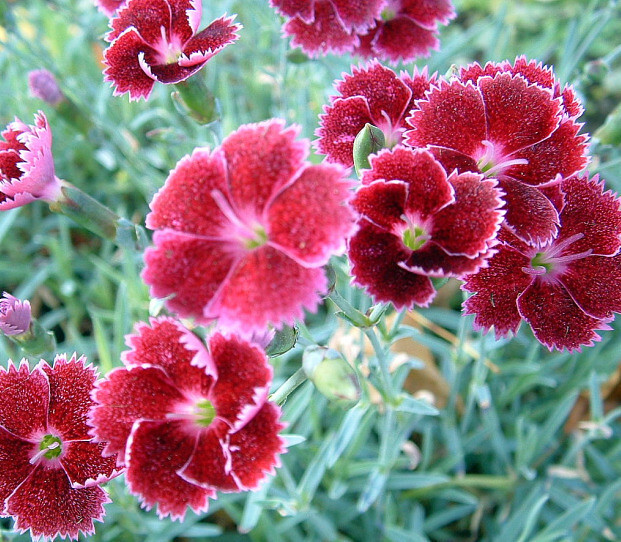 Your flowers are so pretty - love the velvety dianthus. Gorgeous flowers and pictures! You're a Master of All Trades aren't you?! Oh my, your peonies were ruined?! !I have been stealing( I mean given) peonies from my sweet neighbor who has about 8 huge bushes full! Such beautiful blooms. I love that velvety texture. Such gorgeous flowers and beautiful photography too! Sorry to hear that your bike ride was rained out. Are you happy or sad that you had to put it on hold? hi Lori! I feel like I havent visited with you in forever. I did miss your last post somehow.. and what a pretty doll. We had a storm here this weekend that beat the heck out of all my flowers too! But I did notice tonight that they are starting to feel better. YOur flowers are lovely. I really love flowers and the idea of having gorgeous gardens, but the truth of the matter is that I really dont like to garden. id rather do something else! Glad you're getting some time to find joy in your flower beds! The last 2 years I've really let mine slip, too! I must say I have been trying to get some weeding in and my lillies and daisy's are going wild! So pretty! I enjoyed my walk in your garden! your dianthus are beautiful....especially the pale pink. love that one! i have hydrangeas in bloom right now that are heavenly. i'm getting ready for lots of daylilies to pop! 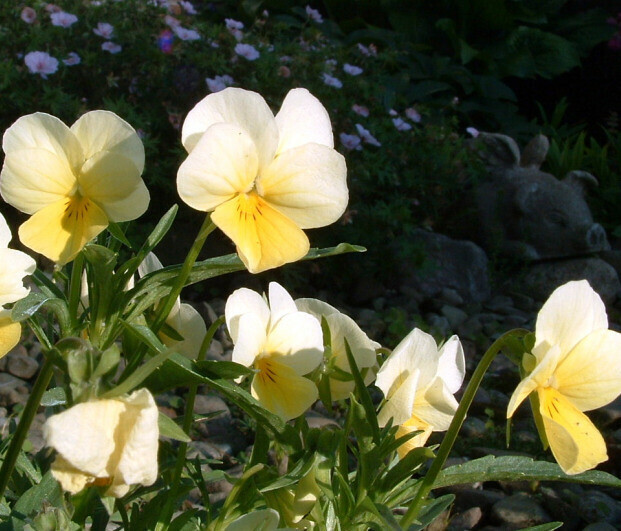 Loads of beauties blooming in your garden! I have been weeding like a maniac also, I look at it as working on my farmers tan. Hope you get that bike ride in this week! Hi Lori! Your flowers are so pretty!! Makes me miss my mom's garden! 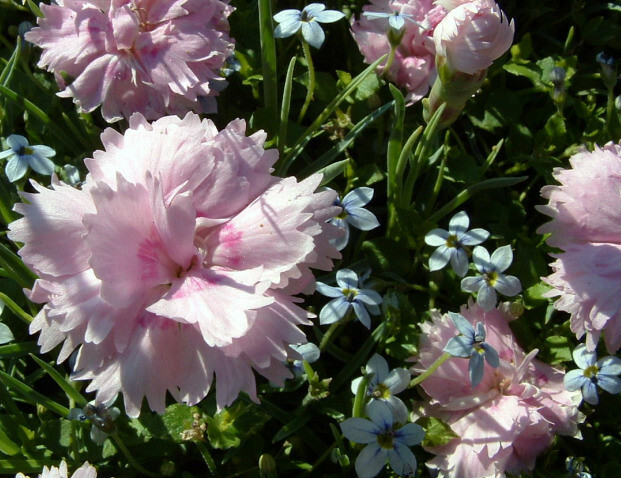 Lovely photos, Lori~ I especially love the dianthus! I have that seem geranium! It is growing like a weed in my frontgarden. And my Dianthus (don't know the variation by heart) have just been planted this year, so no blooms yet. Good luck with the weeds! I am fighting the same war over here. Hi Lori! I love the flowers in your post! Oh and I LOVE LoVe love the little round pillow in your header even more! It's adorable! Now I buy them on the market. When it is full season they are awfully cheap over here and I don't have to hate the rain nor the plants. Voilà everybody happy, especially the man who sells the peonies! Enjoy your other flowers, they seem to be able to face a storm or two! 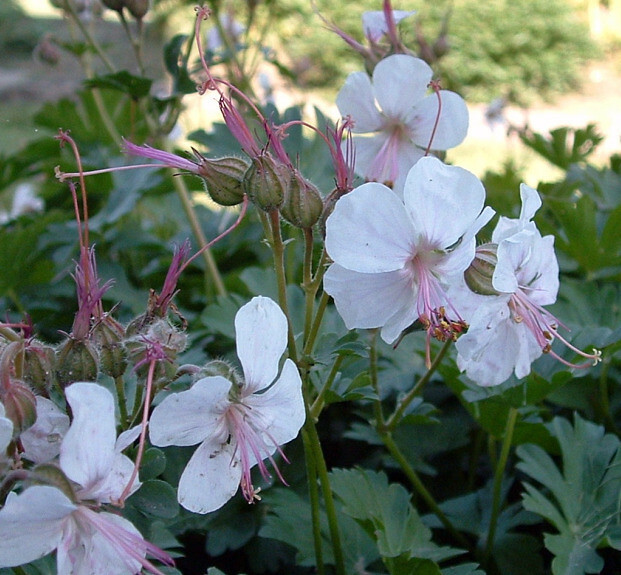 Beautifull photoes, and flowers, I am special taken with the geraniums, so wonderfull. Well pooh!!!! Sorry about the bike ride. The photos of your flowers are just beautiful. 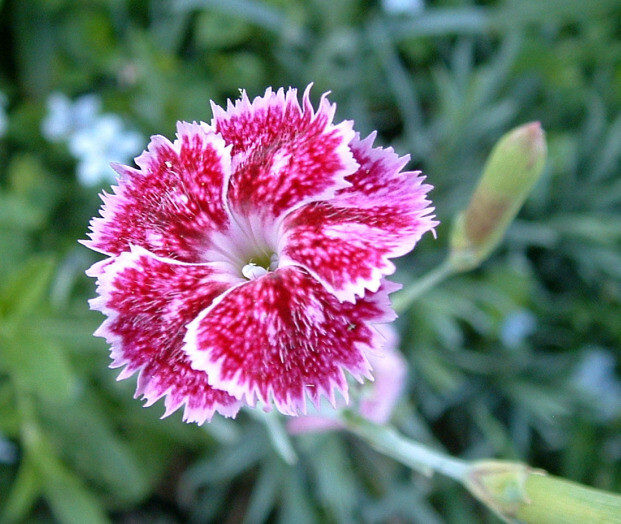 Lori, that photo of your doris dianthus is too beautiful - just love it! So sorry your peonies were ruined (and your bike ride). I have a few peony blooms, pink daisies, my hardy geraniums, and some roses blooming now. Blooming here now - Fairy Slipper Orchids, Northern Fairy Candelabra, & tiny yellow daisies. The wildflowers here really start showing off in July. Hope you have a happy week, Lori! Ha, glad to hear from you, hey, hey! Sorry to hear about the thunderstorms, that's not zo nice. Your flowers look so pretty! In our garden only the annuals are full in bloom, for the rest it's just a jungle! But we're working on it! Lori, I love your beautiful flowers... it is alaways fun to garden this time of the year. There is just something about digging in the dirt! 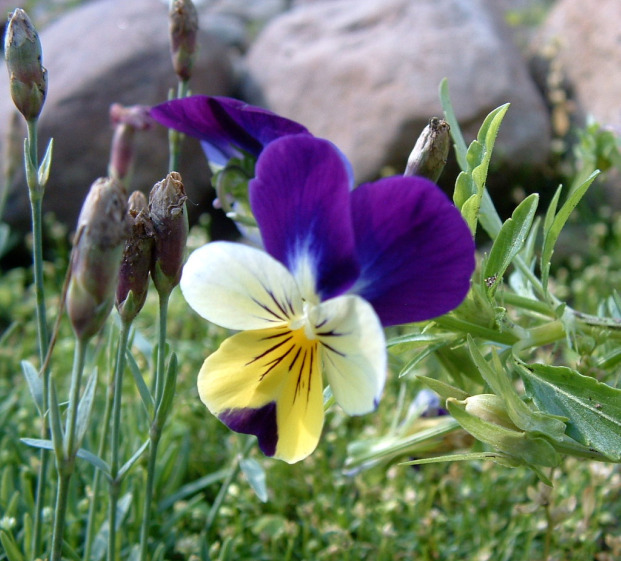 your flowers are beautiful! They certainly don't look neglected Lori! Your dianthus are lovely and I bet that they smell heavenly! I just love their sweet, clove-y scent! I'm also growing Johnny jump-ups on our windowsill and was surprised to discover the other day that they have a pleasant, if faint fragrance. Hope that yours do as well! These flower shots are simply gorgeous Lori! Wishing you a merry month of June! I can't seem to get any gardening done either- and I love to garden. Just so darned overwhelming!! I really want to put bulbs in this fall, though. The flower photos are sensational, did you take the photos? Very pretty.